The dough can be prepared and frozen for up to 3 months. Thaw in the fridge before using. 5. For the icing, stir the whisk the icing sugar with 1 Tbsp of water and the almond or vanilla extract, add the remaining water if needed, until it is a thin icing consistency. Set aside. 6. 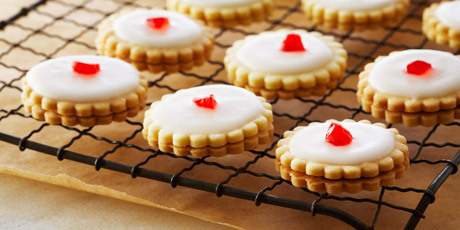 Spread a thin layer of icing on top of each cookie, top with a piece of glacée cherry and set on a rack to dry. Let the cookies dry for about 3 hours before storing in an airtight container.